The Chinese government has been implementing a policy of creating new islands on the reefs and shoals of the South China Sea in order to further Chinese territorial claims to the area and increase sea-based infrastructure. 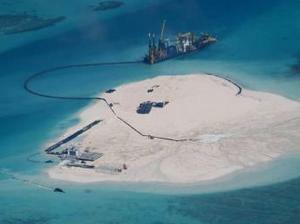 By moving sand and other building materials onto these very shallow reefs, such as the Spratly archipelago, new islands are formed which officials say will eventually support buildings, humans, and surveillance equipment. According to the United Nations Convention on the Law of the Sea, by creating the lands, China will have economic rights within a 200 mile zone of each location. The Chinese government has been implementing a policy of creating new islands on the reefs and shoals of the South China Sea in order to further Chinese territorial claims to the area and increase sea-based infrastructure. As theNew York Times reports, by moving sand and other building materials onto these very shallow reefs, such as the Spratly archipelago, new islands are formed which officials say will eventually support buildings, humans, and surveillance equipment. According to the United Nations Convention on the Law of the Sea, by creating the lands, the country will have economic rights within a 200 mile zone of each location. U.S. Defense Secretary Chuck Hagel criticized the move in a recent speech. China has been engaged in the construction of three to four islands — with one at the Johnson South Reef seized from Vietnam in 1988 — which are estimated to be about 20 to 40 acres each. Already, one contains a military installation. Adding an additional mysterious element, recent digital sketches of intended structures raised eyebrows after being circulated by the Global Times, a state-sponsored Chinese newspaper, with no explanation.